Does Hawkeye's New Avengers 4 Haircut Spell Doom for His Family? Avengers: Infinity War is still months away from release, but Avengers 4 is already filming and Jeremy Renner has reported for duty. Hawkeye will once again be suiting up with his fellow Marvel heroes in an attempt to stop Thanos, but this time Clint Barton looks a bit different. Hawkeye is going to be sporting a new haircut in Avengers 4 and that could mean bad things ahead for the hero and his family. The actor recently appeared on The Late Late Show with James Corden and was sporting a haircut that was a little different than what we are used to from Hawkeye with the sides of his head shaved. The official Jeremy Renner Instagram showed off another look at his new hair, which makes it look like even more of it has been shaved off, possibly giving Hawkeye a mohawk of sorts. But why does it matter if Clint Barton decides to shave off a bunch of his hair in Avengers 4? As far as his family is concerned, it may matter an awful lot. "Quick rest in my nest! #onset #infinitywar #avengersinfinitywar #marvel#stretchitout #hawkeye #tease #soDOPE #russobros"
As many Marvel fans know, there are various versions of the comic book universe. In the Marvel Ultimate universe, which no longer exists, Hawkeye actually has a family, much like the one we were introduced to in Avengers: Age of Ultron. 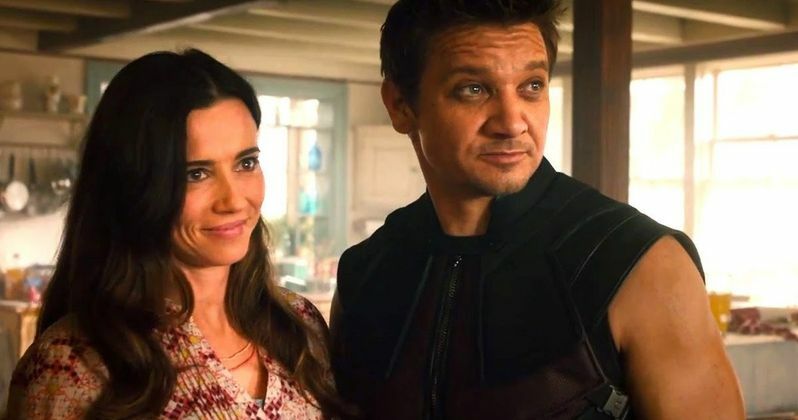 So it appears that Marvel Studios has been taking cues for Jeremy Renner's version of the character from that universe, as the other version of Hawkeye does not have a wife and kids. In the Ultimate universe, Hawkeye's entire family was killed by a traitor at one point, which caused him to go a little crazy. Understandably so. Part of that was him cutting his hair. The other part of the equation is a vigilante costume, which almost made an appearance in Captain America: Civil War. Point being, this could be a subtle clue that means bad things are ahead for everyone's favorite arrow-shooting member of The Avengers. If Thanos does wind up killing Hawkeye's family, that would give him some serious motivation to get back at the Mad Titan come time for Avengers 4. Maybe he'll do something heroic and sacrifice himself? Some characters are going to die in these movies. That much is certain, but they probably won't die without at least going out in a heroic manner. This kind of scenario, though pretty dark for a Marvel Studios movie, would allow Hawkeye to do just that. The fact of the matter is, it is pretty tough to speculate right now since we haven't even seen Avengers: Infinity War yet, which won't arrive until May 4, 2018. Marvel hasn't even released the trailer, even though they showed it at both D23 and San Diego Comic-Con. At the very least, Hawkeye is going to be rocking a new hairstyle in Avengers 4, which will hit theaters on May 3, 2019. Knowing Marvel Studios, there will be a reason for it.